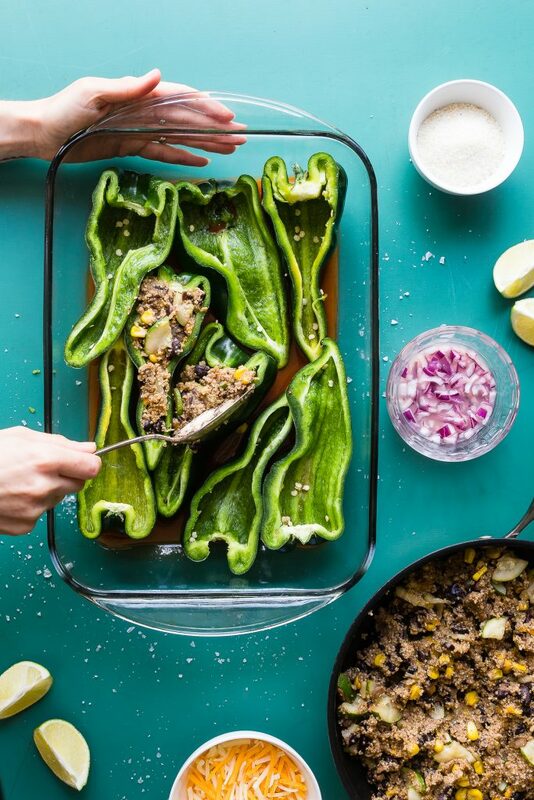 When my daughter gets excited about something, she jumps up and down, waves her hands around, and says, “I’m so excited, I’m so excited!” That’s pretty much how I feel about sharing these Black Bean and Veggie Stuffed Poblanos with you. I’m so excited! 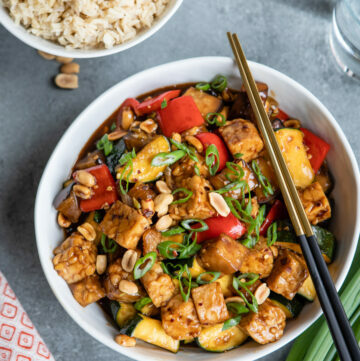 Because I know you’re going to love this recipe. First, you’ll love it because it’s packed with good stuff. Black beans for some plant protein, summer vegetables, and polenta to keep the filling together. A lot of stuffed vegetables are filled with rice and other unexciting things, but here, we stuffed veggies with even more veggies. Yeah! 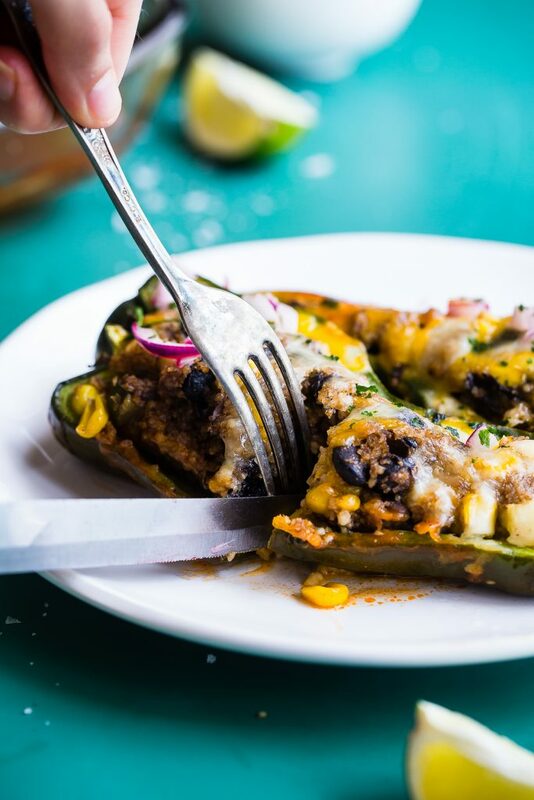 You’ll also love these Black Bean and Veggie Stuffed Poblanos because this recipe can be made in advance and refrigerated for a few days or frozen for up to 3 months. 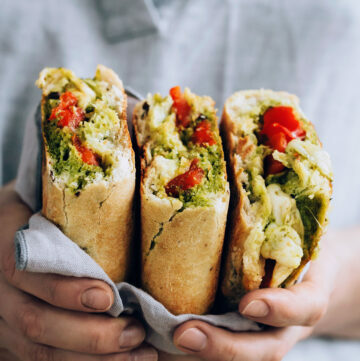 Who doesn’t like a good make-ahead meal option? 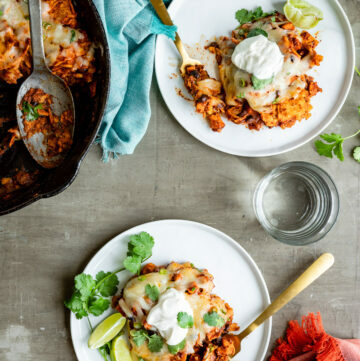 If you’re freezing the recipe, simply assemble and pop the baking dish in the freezer instead of the oven; I prefer thawing in the fridge for a day and then baking until warmed through, but freezer-to-oven will work too as long as you have a baking dish that’s safe for that and allow for some extra time in the oven. And finally, everyone will love these Black Bean and Veggie Stuffed Poblanos because they are one of those rare healthy recipes that totally tastes like something you’d get at a restaurant–in this case, one of those over-the-top Tex-Mex places with piles of nachos and burritos the size of a newborn baby. 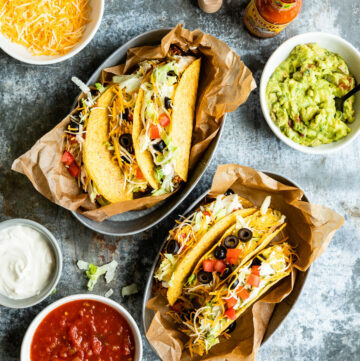 To pull off the whole Tex-Mex restaurant experience, don’t skimp on the toppings! 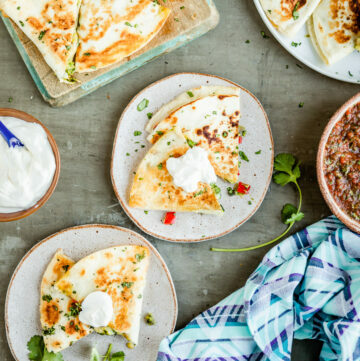 A drizzle of crema, cilantro, green onions, or quick pickled red onions all help take this meal to the next level. Spoon extra sauce from the baking dish over the poblanos before serving too. 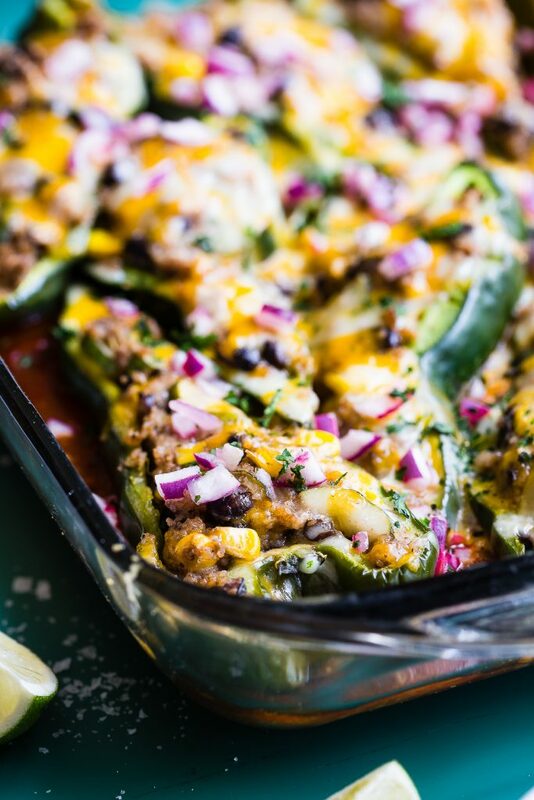 Poblano peppers are stuffed to the brim with black beans, seasonal vegetables, grits and cheese. Preheat oven to 400ºF and spray a rectangular baking dish with oil or cooking spray. Place half of the red onions in a small bowl with the lime juice and a small pinch of salt. Toss to coat and set aside. Spread the enchilada sauce over the bottom of the baking dish. Place the poblanos on the sauce cut side up. Heat the olive oil in a large skillet over medium-high heat. Add the remaining onions to the skillet with a pinch of salt. Cook until softened and starting to brown, about 4 minutes. Stir in the cumin, chili powder, and garlic; cook about 1 minute, until fragrant. Add the corn, zucchini, and beans; cook for 2 minutes. Pour in the stock or water and bring to a simmer, then stir in the grits. The mixture should thicken after a minute or so; at that point, fold in 1/2 cup of cheese and season with additional salt to taste. Stuff the poblano peppers with the vegetable mixture (or if your poblanos are kind of flat, spread the mixture onto them like you're layering a casserole). 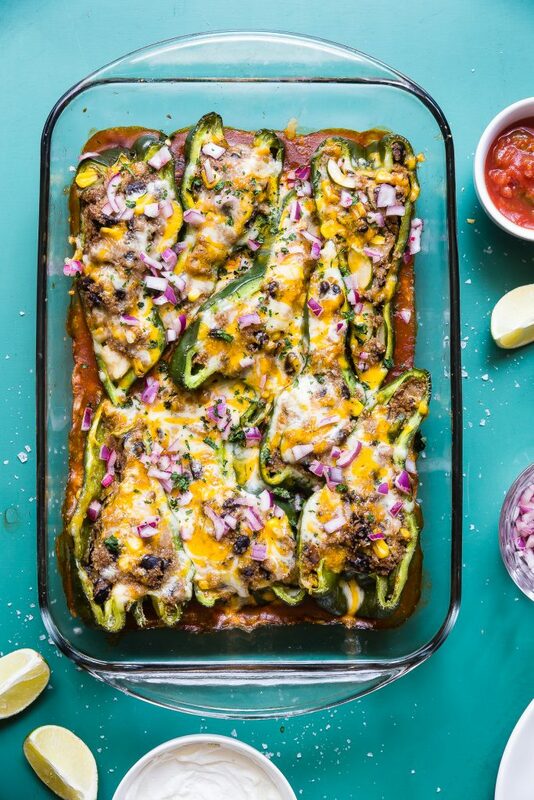 Sprinkle the remaining cheese over the stuffed peppers and wrap the dish tightly with foil. Bake the peppers for 30 minutes covered, then 5 minutes uncovered. Top with the quick-pickled red onions and cilantro before serving.